Should hearing screenings be a part of your routine physical exam? First posted on: AARP Health, December 14, 2015. THINK BACK to the last time you had a physical. Did the doctor ask you anything about your hearing? The answer is probably no. A 2011 analysis of studies on the effectiveness of hearing screening found that almost two-thirds of primary care physicians, including geriatricians, do not include a hearing screening in an annual physical. Wha’? 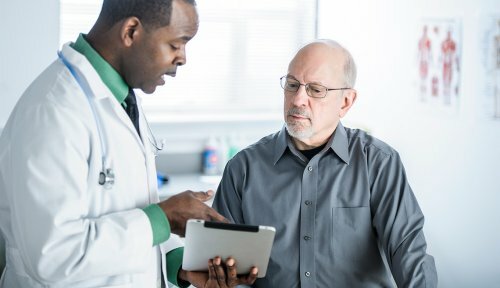 This same report found that there was no risk in screening, that a simple, cost-free hearing test — like rubbing fingers together six inches behind the patient, or a whisper test at two feet -— was effective, and that the rate of hearing aid use went up in patients who were screened by their primary care physician. Despite this, the task force still could not recommend that older adults be regularly screened unless they complain of hearing problems. Wallhagen has been researching the effects of hearing loss on seniors for years. “Screening should be standard practice,” she said. In a report to the Institute of Medicine this year, Wallhagen pointed out some additional costs to society of untreated hearing loss: The loss in income for people with untreated hearing loss due to underemployment is estimated at $176 billion annually. Further, the use of hearing aids was shown to reduce the risk of income loss by 90 to 100 percent for those with milder hearing loss, and from 65 to 77 percent for those with severe to moderate hearing loss. Other studies have found that the primary care physician can play an important role in the identification and treatment of hearing loss. A 2000 study found that 63 percent of people listed their primary care physician as the most important source of information about where to go for hearing health care services. The study also found that people with hearing loss are eight times more likely to be positively inclined to purchase a hearing aid if their physician recommends one. This year, the Hearing Loss Association of America (HLAA) strongly recommended hearing screening in all adults during routine physicals, as well as during the “Welcome to Medicare” assessment and annual Medicare risk assessments. For now, you may have to ask your doctor for a hearing screening. But patients shouldn’t have to broach the subject. Many older people are unaware of the gradual encroachment of hearing loss and wouldn’t think to ask for a screening. A screening should be a standard part of any annual physical, especially for those over 65. If the screening shows a problem, the doctor should refer the patient to a hearing professional. It’s simple: Hearing aids work. Even though my SSD was known for years I never had a physician of any type ask me about it. If I hadn’t been proactive about this and asked for a referral I would not now have a Baha4 Attract and be a community hearing advocate. Fortunately, my audiologist told me about all options and I send people to him regularly. Speak up! Shocking but not surprising. Physician paying attention is especially important for single-sided deafness because it could well be a symptom of something serious. It’s one of the red-flag conditions. We all need to speak up. Glad you are too. Thanks for writing. Good idea. But it’s much easier to mandate something with infants than it is with seniors so not likely to happen.